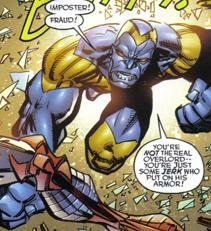 When OverLord III had murdered Buster Justice and seized control of the Vicious Circle, many of the group’s members were unhappy with this turn of events. One such member was “Blueberry Surprise” who made an assassination attempt on his new leader. This attack resulted in his intended victim reluctantly killing him with a powerful blast.